What makes a microscope a "kids microscope"? There are a few important items. Just because a microscope is made for kids, it should still have glass optics. Many kids microscopes are made from plastic and can leave children frustrated with blurry images. Kids microscopes are generally smaller in size. The microscope should have safety features built into it such as a rack stop to prevent the objective from crashing into the microscope slide and causing damage to the lens. Many kids microscopes are cordless - this allows kids to gather around a table without tripping over a power cord. The microscope shown below is the 104-LED microscope. This microscope can run off batteries or an optional power cord. 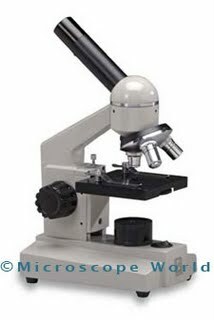 When purchasing a microscope as a gift for a child, including some prepared slides with the microscope will ensure that the child has immediate specimens to view upon opening the gift. Microscopes can open up a completely new world to children and provide hours of educational entertainment.